TS18: Best of the Old West! Now available, the Smokebox Central Pacific Ten-Wheeler “Buffalo” delivers more captivating “Old West” railroading! It was the railroads – and specifically, the monumental Union Pacific-Central Pacific transcontinental railroad of 1869 – that truly opened up the great American West. 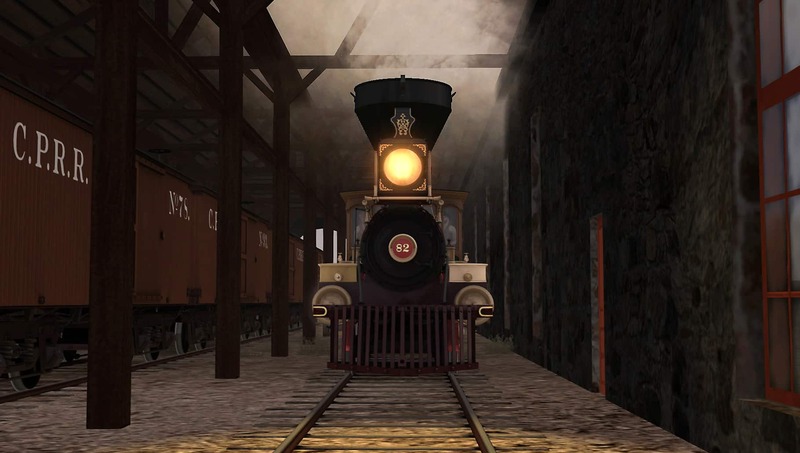 Smokebox has masterfully and authentically brought 1860s “Old West” railroading to life in Train Simulator with its CPRR “Jupiter,” Union Pacific No. 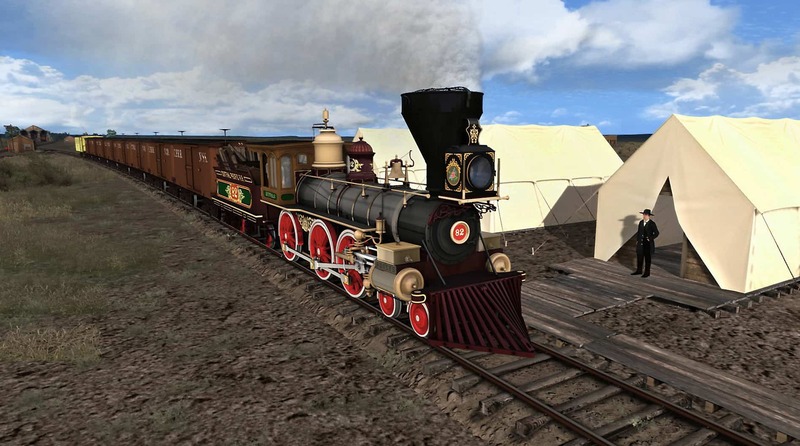 119, and 1869 Cheyenne route – and now the Old West experience in Tran Simulator becomes even more captivating with the arrival of Central Pacific’s “Buffalo” Ten-Wheeler! Constructed at Paterson, New Jersey by the Rogers Locomotive & Machine Works in 1868, Central Pacific’s “Buffalo” class included five steam locomotives (CPRR road numbers 82-83; 85-87). Based on Rogers standard 4-4-0 design (of which one example was historic Union Pacific No. 119), the locomotives of CPRR’s Buffalo-class were (as compared to the omnipresent 4-4-0s of that formative era) equipped with an extra set of driving wheels, making them 4-6-0 “Ten-Wheelers” which were particularly well suited to handle tonnage on the grades of Central Pacific’s famed Donner Pass. CPRR’s Buffalo-class locomotives were wood burners and the 4-6-0s employed 18” x 24” cylinders, 57-inch drivers (with tires), and produced 13,000+ pounds of starting tractive effort. With their extra set of driving wheels, the Buffalo-class Ten-Wheelers had less space to fit the valve gear and crosshead pumps, leading to a cramped appearance in the area just behind the cylinders. But dressed out in a vibrant livery of gunmetal, black, red, and green, the CPRR Ten-Wheelers were surely colorful and stunning to the eye. 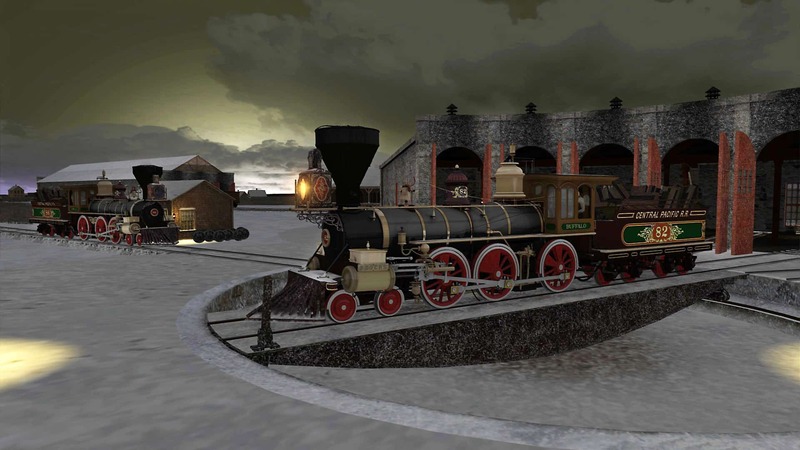 Smokebox, and its digital artisan Mike Rennie, are the creators of landmark Train Simulator steam locomotives including not only CPRR’s “Jupiter” and UP No. 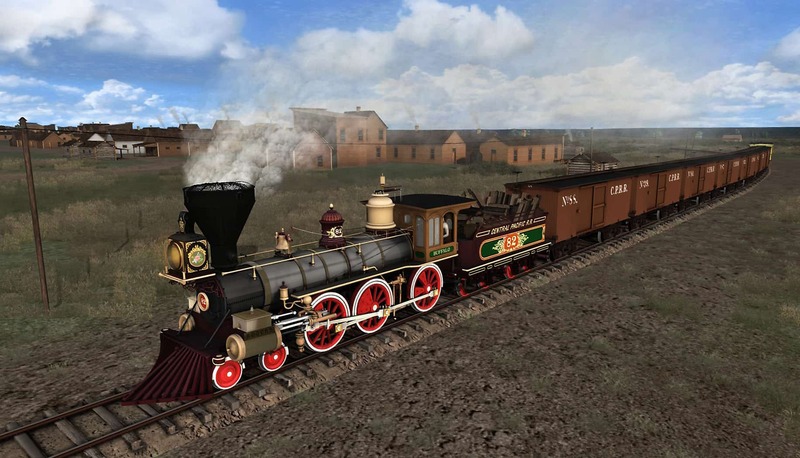 119, but the fabulous Union Pacific FEF-3 4-8-4 and iconic AT&N 2-8-0 Consolidation, so it comes as no surprise that the new Train Simulator Central Pacific “Buffalo” re-creates the historic CPRR Ten-Wheeler with an absolute fidelity to detail and authentic operating characteristics. Indeed, the Smokebox “Buffalo” will provide a variety of operating challenges to the engineer, including stoking a wood-burning fire, managing injectors and boiler steam pressure, handling realistic throttle lag, and dealing with genuine wheel slip. With numerous interactive and animated elements, the “Buffalo” is remarkable in realism. Smokebox provides expert and simple operating modes that make the locomotive fully accessible and enjoyable for users of all experience levels. Joining Central Pacific No. 82, the “Buffalo,” in this new DLC is sister locomotive CPRR No. 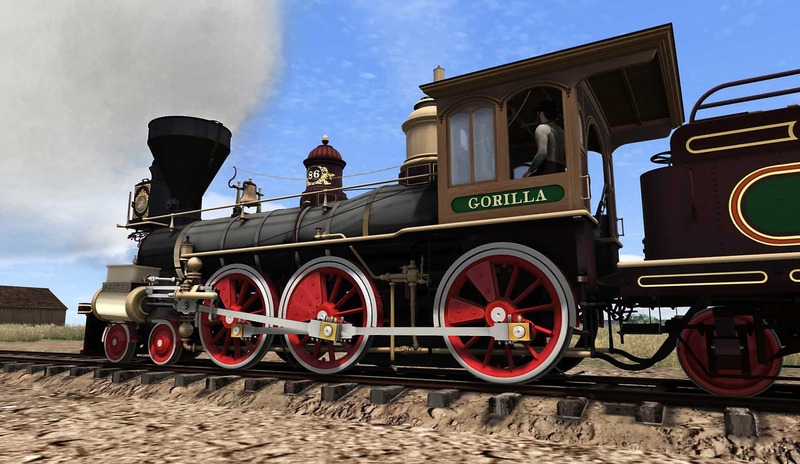 86, the “Gorilla,” plus two new pieces of period rolling stock – a CPRR wooden boxcar and caboose-coach. 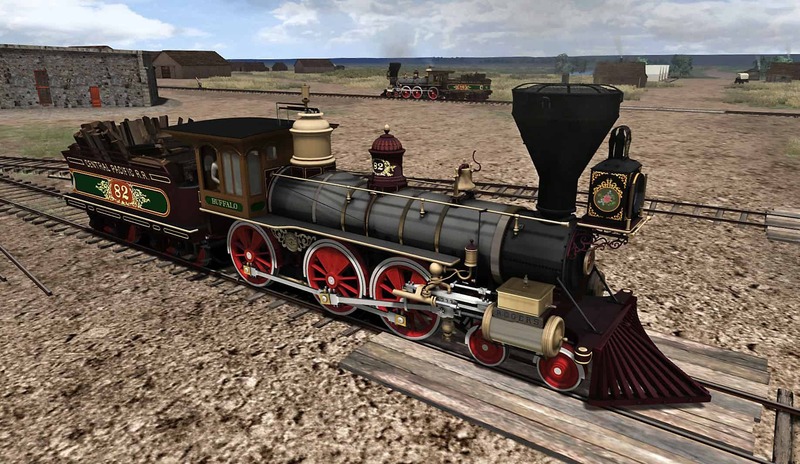 The “Buffalo” pack also feature three career scenarios set on Smokebox’s captivating and detail-rich Cheyenne 1869 route (as included in the “Union Pacific No. 119 Steam Loco Add-On” DLC which is available as a separate purchase). “Old West” railroading at its best awaits you with the now-available Central Pacific 4-6-0 “Buffalo” masterfully created by Smokebox and Mike Rennie! 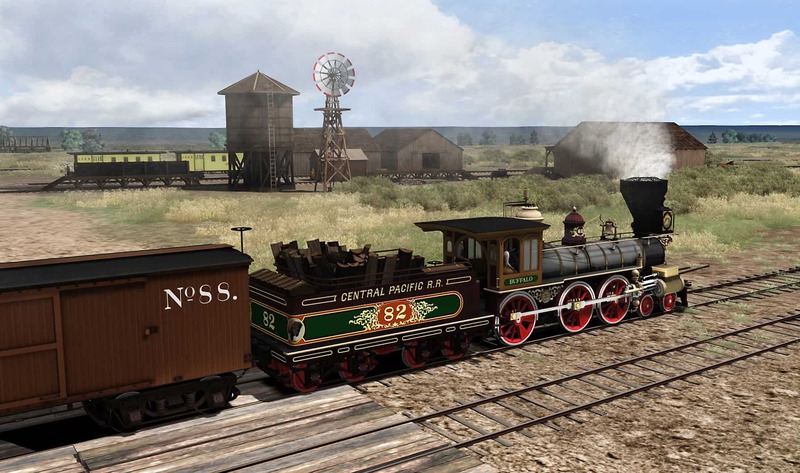 Dressed in a vibrant livery of gunmetal, black, red, and green, the classic 1860s Ten-Wheeler has a string of wooden boxcars in tow as it strides into Cheyenne on Smokebox’s “1869 Cheyenne route.” Screenshots by Gary Dolzall. Central Pacific Ten-Wheeler No. 82, the “Buffalo” (above), was one of five kindred 4-6-0s constructed for the CPRR by the Rogers Locomotive & Machine Works in 1868. Sister locomotive No. 86, the Gorilla (below), is also included in the new DLC and in this scene clearly illustrates how the 4-6-0s extra set of driving wheels (as compared to a 4-4-0) required a snug fit for the value gear on the Buffalo-class Ten-Wheelers. 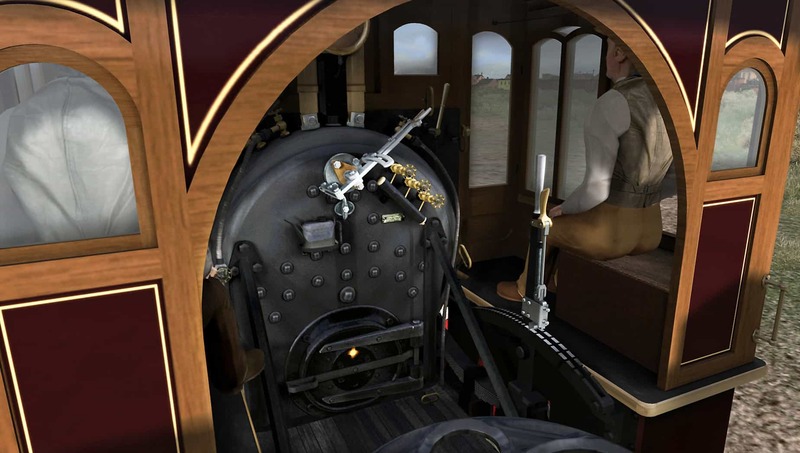 When you climb into the cab of the new Smokebox Central Pacific 4-6-0, a variety of operating challenges await you, including stoking a wood-burning fire, managing injectors and boiler steam pressure, handling realistic throttle lag, and dealing with genuine wheel slip. With its numerous interactive and animated elements, the “Buffalo” is remarkable in its realism and the authenticity it delivers! On a sunny and pleasant day at Cheyenne, CPRR’s “Buffalo” begins another westward journey with its tender stacked full of wood. CPRR’s Buffalo-class locomotives employed 18” x 24” cylinders, rode on 57-inch drivers (with tires), and produced approximately 13,000 pounds of starting tractive effort. In addition to two cords of wood for the firebox, the locomotive’s tender held 2,000 gallons of water for the boiler. Few things are more magical than the combination of steam locomotives, nighttime, and snow, and such is the case as CPRR No. 86, the “Gorilla,” makes a nocturnal station stop at Cheyenne (above), and No. 82, the “Buffalo,” takes a spin on the Cheyenne turntable (below). 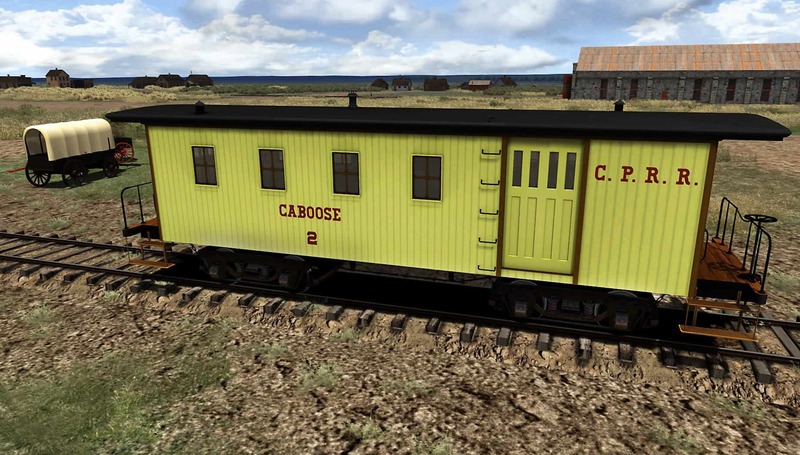 The Central Pacific Buffalo DLC includes period-authentic rolling stock: A CPRR wooden boxcar (above) and caboose-coach (below). 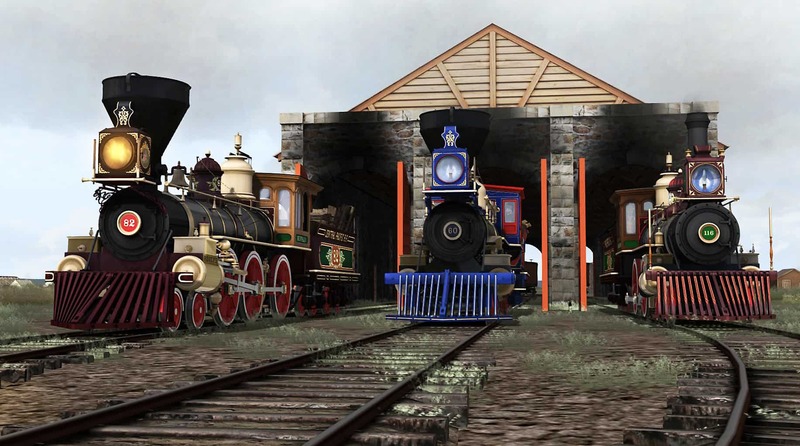 The 4-6-0 and rolling stock are put to work in three career scenarios set on Smokebox’s “1869 Cheyenne route” (as included in the “Union Pacific No. 119 Steam Loco Add-On” DLC which is available as a separate purchase). 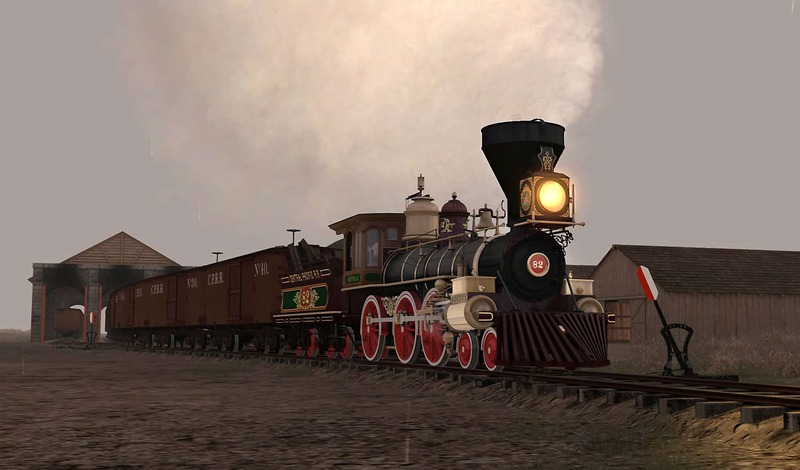 Smokebox has masterfully brought 1860s “Old West” railroading to life in Train Simulator with its CPRR “Jupiter,” Union Pacific No. 119, “1869 Cheyenne route” – and now Central Pacific’s “Buffalo” Ten-Wheeler (at left). 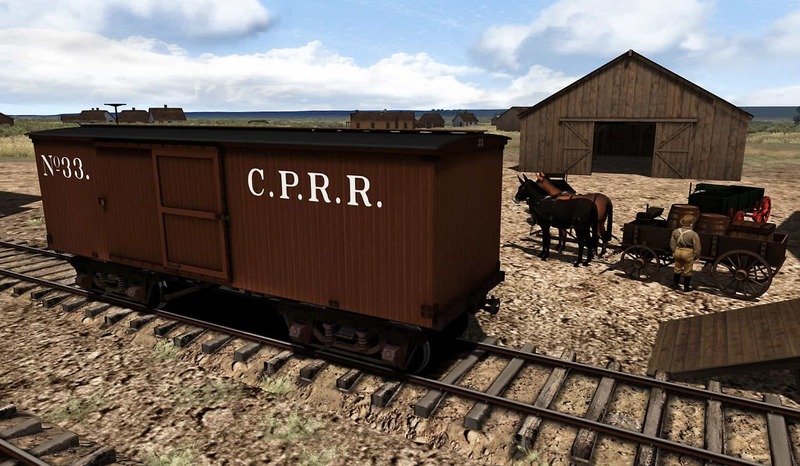 The Train Simulator CPRR Buffalo pack is available now at the Steam and Dovetail Games stores!